Margaret writes to Jessie about colds in the family, social life, and the progress of the baseball team. I rushed all day Sunday and couldn't write to you just then. I meant to write to you yesterday morning, but forgot and went to sleep instead, having a wretched cold which is taking the regular course of colds, and is making me miserable. I don't know whether Mother has written to you this week or not, and told you about Father's cold. He came back from Pittsburg with a heavy cold, and has been in bed ever since, with the exception of one night, suffering dreadfully with sore throat and headache. The doctor says that the trouble is entirely local, and not serious, so don't worry. I will will write later in the week, a word about him to you and Nell. The baseball team is doing pretty well. It got beaten in the south once by Georgetown. They beat Georgetown in the first game with her. They were also beaten here by Fordham. Aunt Margaret went to it and since that our men played locally. They say that the Fordham men were sort of professionals. I am not coming dear to Baltimore this week. Please tell Mary White when you see her that I won't be able to go to the Bach choir with her. Tell her that I really do intend to write soon. My spring suit is going to be a dream. My hat is awfully pretty too. Did you like the little Le Févre girl that you went down with?I am to be in Baltimore on my birth day Tuesday the sixteenth of April. I hope that the girls will will present me with a view of their faces for a few minutes. Are you all very busy? Have the seniors begun to go to Spring entertainments for them? Oh I wish that I were graduating with them. There is nothing to tell you. Have had a few callers and that's all since you left. Give my love to the girls, and keep as much as you could possibly want for your own fine sweet self. 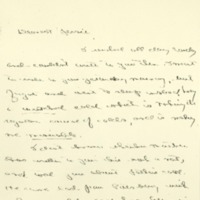 Wilson, Margaret Woodrow, 1886-1944, “Margaret Woodrow Wilson to Jessie Woodrow Wilson Sayre,” 1907 April 9, WWP17384, Jessie Wilson Sayre Correspondence, Woodrow Wilson Presidential Library & Museum, Staunton, Virginia.